They're still on track for Rio. The Matildas are strongly fancied to give Australia's its best ever shot at a medal in the sport of football at the Rio Olympics in August. Perhaps they should be grateful there will be no under-16s boys' teams in their pool. In a friendly match against the Newcastle Jets under-16 boys team on Wednesday, the Matildas were humbled 7-0. That's right, the team ranked fifth in FIFA's women's rankings were roughed up by a bunch of lads barely old enough to shave. Here's a fairly common reaction. No, it's not good at all. But there were, at least, some excuses. 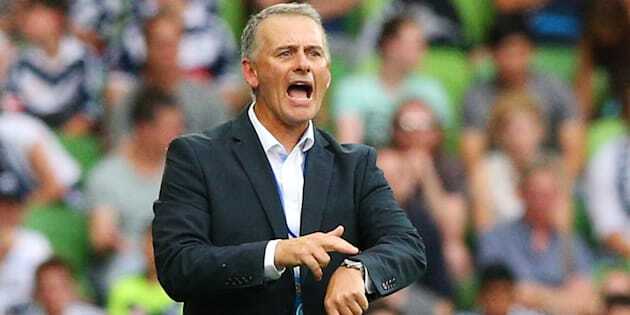 Gary van Egmond is assistant Matildas coach and academy director of the Newcastle Jets. "To be honest we didn't expect that," he told The Huffington Post Australia. "But the Jets boys were very good. All credit to them. They moved the ball around very well and were excellent on the night." Van Egmond explained that the Matildas are often forced to play boys' teams because there is not enough quality female opposition in our part of the world. This match was a warm-up for two friendlies against New Zealand's national women's team, the Football Ferns. Gary Van Egmond reckons it's time we cut the Matildas some slack. The last time the Matildas played a team of 15- and 16-year-old boys, they drew 2-2. On Wednesday night, van Egmond said the team was short of match practice. "I think there were a couple of contributing factors to the loss. At this stage in their preparation, obviously the Matildas are not in a position to play regular games so I'd suggest all and sundry were a little bit rusty. "We could have had an easier game, but we definitely want to keep testing the girls." Van Egmond also had strong words for those who would question the strength of women's football on the basis of this result. "It all relative," he said. "It's no different from [the sort of result you'd expect] from a female tennis player or a female swimmer against a 15- or 16-year-old boy who's maturing and starting to develop physically." "They have to be looked upon as two separate entities." The Matildas were missing several established internationals on Wednesday night, including star striker Kyah Simon. They also rotated players more than usual, which contributed to a lack of cohesion. The Matildas play New Zealand in Ballarat on June 4 and in Melbourne on June 7. The second match is part of a double-header before the Socceroos take on Greece in a friendly.